I moved and changed jobs almost simultaneously this spring. As a result, I’m off the academic schedule for the first time in over a decade and it’s throwing off my whole concept of summer. So Tuesday night I went to check on the Cardinals score and discovered, to my dismay, that they had just finished one of the two games they are playing in NYC that I could actually attend. Luckily, they were playing the Mets, which isn’t exactly a tough ticket to get at the last minute these days. 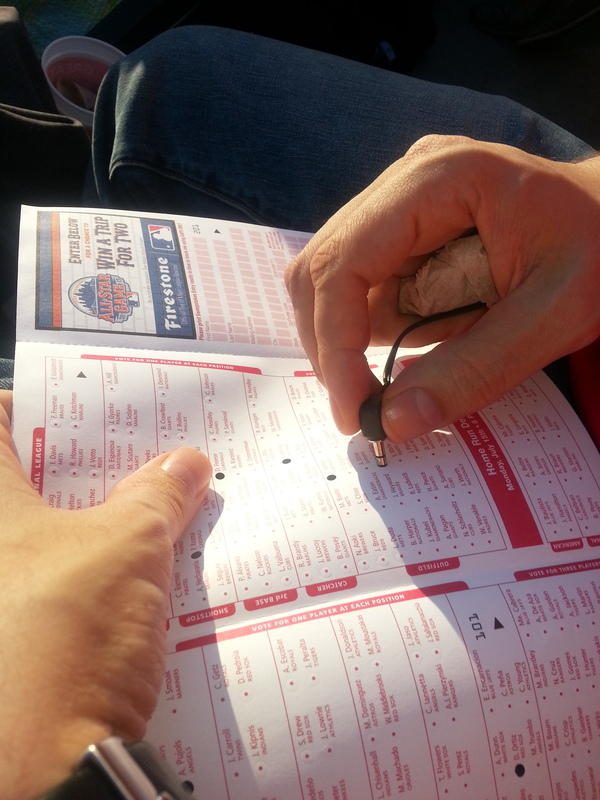 So Wednesday night, my boyfriend and I headed out to Citifield, where around the actual game action, my blog post wrote itself. First off — paper all star ballots! Nostalgia! Also, once we had established that I somehow didn’t have a writing implement in my purse, we discovered that the plug end of a pair of headphones is actually the perfect tool for punching the holes out of the ballot. The hardest part about filling these out was trying to remember who was on the disabled list, particularly in the AL. (That’s not a Yankees joke — entirely.) Then we put them in the ballot box to be buried under everyone’s 35-per-person internet ballots. I’m still looking forward to the All-Star Game if only because I was out of town when it was at old Yankee the last time, and since both the marathon and Fleet Week were canceled this past year, we’ve been lacking in the crowds-of-people-in-uniforms-descending-on-the-city-to-be-ogled department. Just before the 7th inning stretch, this happened. The crowd seemed primarily delighted, with an undercurrent of bemusement. I certainly think Kidd can handle the in-game/practice side of coaching, but I’m a little unsure how the front office/roster building side is going to go, especially with a front office that can be …mercurial. The scoreboard proved a great source of entertainment throughout the game. 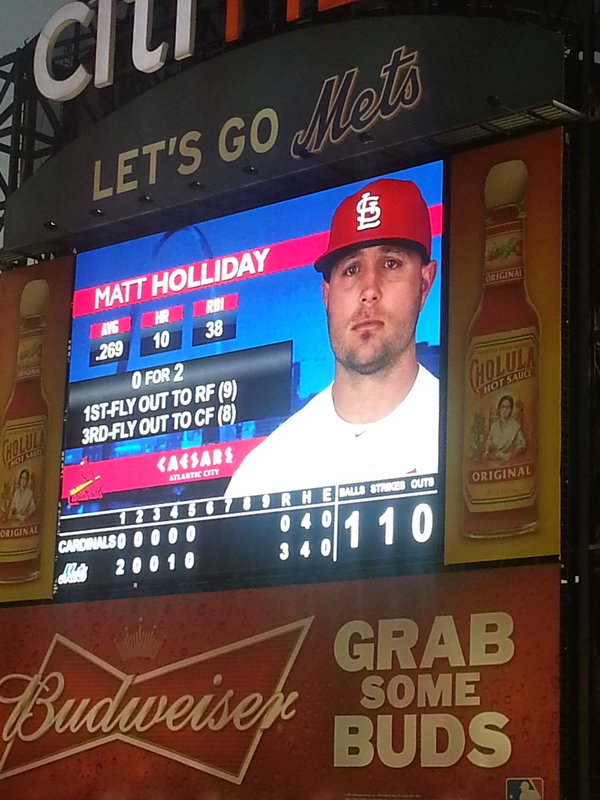 The consensus in our section was that Matt Holliday has the saddest media photo ever. My boyfriend’s comment: “That’s totally an ‘I’m going to go 0-4 and we’ll lose by 5,’ face.” So perhaps he’s not sad, he’s just psychic. 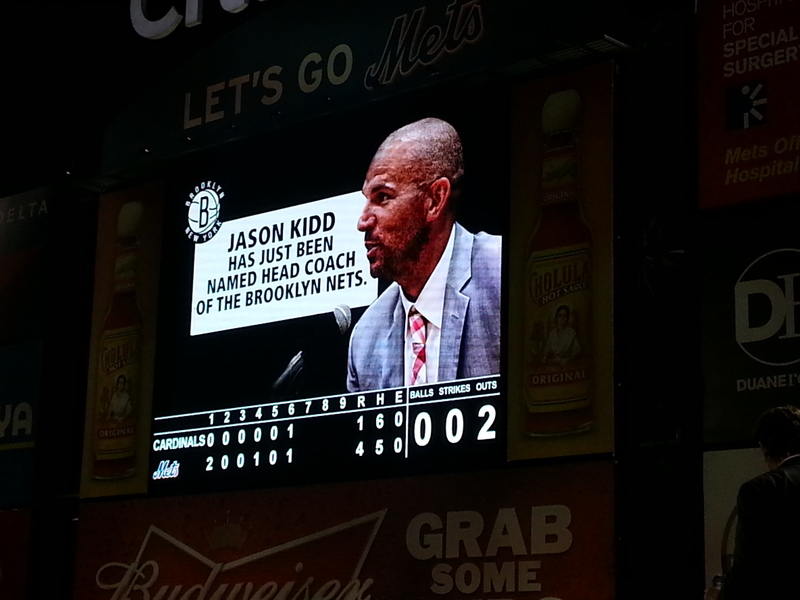 Also appearing on the CitiField board, periodic Stanley Cup Final updates! I didn’t get a picture, but the updates piqued my interest enough that even though the 2 hour and 40 minute game time got us home well before 11, we then stayed up past 1 watching the 6th longest Stanley Cup game in history. Happy Friday! Anyone else going to a game this weekend? This entry was posted in Baseball, Boston Bruins, Brooklyn Nets, Chicago Blackhawks, Games Mistress, Hit and Run, MLB, MLB All-Star Game, MLB Photo Day, New York Mets, NHL, Overtime Hero, St. Louis Cardinals, Stanley Cup Playoffs by Tres Geek. Bookmark the permalink.